The Cardas Iridium is a great budget interconnect from Cardas Audio! This is a great cable for entry to mid level audiophile listening! The Cardas Clear Sky delivers a lot for a modest price! Clean and neutral! 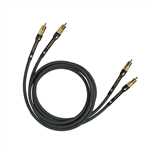 A great cable from Cardas - the Cygnus is part of the Clear line of cables! The Clear Reflection delivers the Cardas traditional sound! The Cardas Clear represents the best cable available from Cardas - and it is a real beauty! Cardas Clear Beyond is the top of the line interconnect from Cardas Audio! Highly recommended!! !